OK, I was feeling grumpy-er. Always play to one’s strengths. I was walking down Fifth Avenue, heading to Rockefeller Center. Visitors to New York filled the sidewalk. They stopped in the middle and made quick turns. They abruptly countermarched, heading back uptown without warning. My blood pressure rose. My ire increased. And then I saw her. She sat in a wheel chair, looking at the lights and the sights. I do not know her name and never learned her story. It was inappropriate to ask. But I wondered. Was this her first time in New York – the culmination of a long-time dream? Was she a long-time city resident? Was this an annual visit? In the end, the reason mattered not. All that mattered was her face. She glowed. Amazement. Wonder. Delight. Many words could describe her face and bearing. But the one that works best for me, is joy. Simple joy. Pure joy. Unabashed joy. I have not seen such joy often, but I have seen it enough that I recognize it when I do. I saw joy that day and I carried it in my heart to Rockefeller Center. I hope it showed, just a little, on my face. See you along the trail. P.S. – the photo was taken inside the Time Warner Center on the same day. I did not get any photos at Rockefeller Center. I will be back. Watching first-time visitors to the city see New York from the air, as the plane makes its approach, fills me with delight and leads me to smile. Seeing New York from the air, as the plane makes its approach, fills me with delight and leads me to smile. A movement caught my eye. I sat at the kitchen table in Cleveland Heights, working on one of the presentations I will make in Wooster this weekend. The blur of dusky brown drew my attention from the computer. 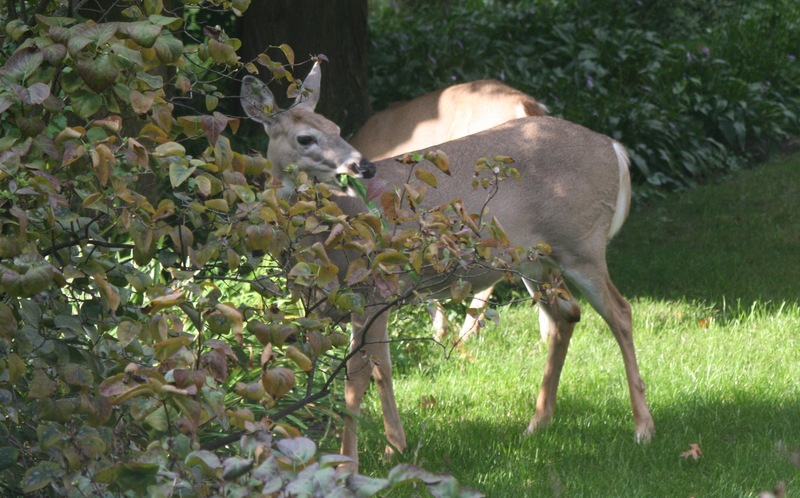 Deer appear regularly at the Erie Shire; more regularly than I do. On this late afternoon, three doe (yes, only two appear in this picture) grazed the buffet of flora that our back yard offers. Not wanting to frighten them, I took pictures through the window.